I'm new to soccer, and it's the first sport I've ever followed. As a feminist it has been incredibly disheartening to discover such a festering, unhealthy and abusive culture of sexism and homophobia around the sport anytime I venture outside of virtually all-female fandom spaces, or even within them. Thanks for your comment, and for the link! I wonder is Sian Massey has played - being a ref is an option for a professional life in the game, whereas playing for a living is not. I worked in sports for years as the lone female, enduring abuse and the revocation of a scholarship just because I am that female. Thank you for such an intelligent and well-written post on the abhorent state of things. Ugh. Great write up, I work in sports and write free lance regarding women's rights (a wide range) in the US. This piece illustrates exactly what we as women and as women athletes deal with. I really appreciate this. The past few days have been a whirlwind of comments on various football sites I visit every day without fail. What has been most interesting to me has been the actual bloggers' responses to this "sudden scandal". They tend to be sympathetic but at the same time rolling their eyes a bit and making sure to draw the line just above showing pictures of "hot" female sports journalists. A perfect example, a meta illustration. This was Sunday before the story really started to take on a life of it's own. I won't detail for you the debates that followed because obviously all outspoken women who are football fans and active on the web have been experiencing the same thing. What I will say is that I'm revelling in the eloquent and brilliant comments coming from all over the world and from male and female. I love that I was led to this fantastic post by Dirty Tackle, the one "lighter" footy blog that has always taken a modern, considerate, and unwaveringly anti-misogynist, anti-homophobic stance. I love that as a result more woman will be on the road to being linesmen(?). I will try to focus on the positives while I continue to wade through the filth. Thank you for your insights and I'm thrilled to be adding your blog to my favorites list. I admit that I am not a regular reader of your blog, that I stumbled across this post as I was looking around the internet on various football blogs, but in any case, I think my message still has value. As a kid growing up in southern California, there weren't a whole lot of people I knew that didn't play soccer, be it boys or girls. Some of my best friends were on the girl's high school soccer team. I currently know girls that play soccer in college. I have watched professional women's soccer games on FSC (they show the occasional game), and while attendance, and no doubt viewership, is lower, they still take the trouble to show the games even if they're tape delayed. I think the criticism on the behemoth that is sports media is slightly harsh. It isn't a problem with the media, as the media will do whatever it takes to make a buck. Instead, the problem lies with the lack of viewership and following. There's a stigma (whether correct or not) that women's sports are played at a lower level. That is to say the athletes are not necessarily worse, but they are not able to perform at the unbelievably high levels that their male counterparts are. Because of this, people don't care to watch. Taking gender out of the equation, I know that if I had the choice I would watch the highest level of a sport that I could. If its between the Premier League and League One or league Two, I would rather watch the Prem. Please don't take this as male chauvinism, as I have done my best to make this comment as objective as possible. I'm simply trying to call attention to the fact that, for the vast majority of people, there is a preference to watch the best in the world compete. In this case the passing, finishing, off the ball movement, and general standard of play has a tendency to be higher in the men's game. I will not say that this is always the case, as I have seen some rather thrilling, physical, and generally intelligent women's games. And until the women of the sports world gain a wide following, I'm afraid that they won't get the respect that they deserve in the media. First off:- Thanks for an interesting read Jennifer. I've been reading this blog for a while now and it's great to see football from what is, to me, a completely new perspective. On to the story at hand: This week has been rather embarrassing for me. Have you ever been in the position where you've defended someone, only for them to go and prove they really are the idiot everyone's been saying they are? When the first Gray and Keys clip was published I was amazed at the outcry about it. I argued with friends and bloggers that it was just a bit of banter and that no harm was meant. However, as more evidence has emerged it's become clear that Gray and Keys really are as ignorant and obnoxious as everyone else was saying. One of the things that surprised me most though was that the outcry was coming from journalists, players and fans who make those kind of comments on a regular basis. The hypocrisy is staggering. It would make a politician gag. Unfortunately I think you've hit the nail on the head in your last two paragraphs. Will this really change anything? Gray and Keys are gone and Sky will probably issue some new strict workplace guidelines which will just effectively outlaw all humour on and off screen (as if football commentary isn't bland enough as it is), but the real issue of getting women's football seriously and fairly promoted and developed will just be swept under the carpet. 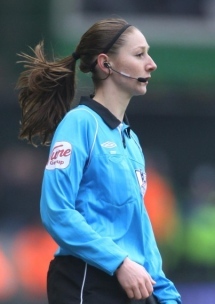 On a brighter note, I saw Sian Massey on New Year's Day as she was running the line at Watford v Portsmouth. A guy behind me pointed out that we had a female official a few minutes into the game and I'm pleased to say there were no derogatory comments, at least not from the 50-or-so fans within earshot. There were a few comments along the lines of "Ooh, she's quite fit!" but nothing unpleasant, and the general consensus after the game was that she did a good job and, like all good officials, wasn't noticed too much. At least the sexism isn't quite absolute. Maybe there's hope yet for the sport. I have only just recently become a football/soccer fan (American, female, 23, for context), and I have jumped in feet first. I'm highly active in the Twitterverse, and I've started running the blog for the German men's national team over at World Cup Blog. I'm trying, gradually, to come to grips with the world I've entered. I think it's helped that I've steered largely clear of British football culture, because I think there's a lot festering there. Instead I've focused on the German Bundesliga, and the niche I've found on the internet which, while quite male, has been very accepting and lovely, almost without exception. It's the kind of guys who worship Dirty Tackle. But even in the safe space I've carved out for myself, there are incidents - small things, but I notice them, and I try to call them out when particularly egregious. I think my presence in the sphere of a lot of these guys has already started to change their perceptions a little bit. And that's all we can do - we can put ourselves out there, get vocal, provide absolutely irrevocable proof that we CAN do this, that we can participate and contribute and understand as well, if not better, than any man. Then we can take those many men who AREN'T monsters, simply a product of the world we live in, and show them a new truth - the good ones will take it to heart and continue into the world carrying that changed perspective. I'm not on a crusade or anything, but I am certainly aware of how I present myself as a female fan. The internet is an amazing platform for giving women a voice, and the rise of the blog as a respected venue helps further. I'm definitely going to start following your blog - I love finding fellow ladies who love the game. It kind of bums me out that the most visible female-written football blog is Kickette, which I find mildly entertaining but really has nothing to do with the actual GAME (not to mention it completely ignores all my favorite players). But I think we're slowly changing things. Jon: The underlying thread in your whole comment is that the women's game is inherently worse than the men's. You claim that women's sports won't get respect until they get a wide following. But I put this to you: they won't get a wide following until they get respect. Do you see the catch 22 here? The problem is not that women "are not able to perform" at the same level as men; the true problem is that at every single level, women's soccer is seen as fundamentally inferior, so girls who have dazzling talent are either discouraged from pursuing the sport, or don't ever get the proper training or support to do so. Teams are underfunded, shoved to the side, and generally ground into the dirt. How can they possibly reach the same heights of play quality as the men's game in this condition? The men's game where ugly players like Nigel De Jong continue to receive obscenely enormous paychecks and live in palaces. Where boys are nurtured from age 2 to kick a football, and are given a free pass in life if they turn out to be really good at it. It's a vastly unfair comparison and ignores all of the insidious inequalities that serve as the basis for unequal levels of play. The comments have been fantastic - and cheekybackheel, thank you for explaining things for jon (who expresses a commonly held viewpoint). It is hard for a lot of people to grapple with the notion that market forces may actually have a relationship to things like sexism and racism. awesome point about De Jong, too. thanks for this which (as expected) hits the nail perfectly on the head. Happily in my 5 years as a football blogger I've almost never had this type of comment, which I think is almost entirely because I avoid discussing English football. I don't think this is a coincidence. I have had one or two sexist comments but never aggressive, to my recollection. One thing I find interesting is that, living in Italy (a highly & systemically sexist country), attitudes to women in football are actually less neanderthal than in the UK. Serious commentary from women is much more normal, much more widely accepted than in the UK, and nobody here has ever suggested to me that I know nothing about football just because I'm a woman. I see many more female fans at matches than in the UK and the assumption is that women are more than capable of understanding and discussing the game. There was a lot of coverage last year when a Serie A game had *two* lineswomen not just one, mind you. The problem is not that the woman’s game is inherently worse, the problem is that what little is shown on TV LOOKS worse…if you take the top men’s teams in the world and put them on a 2nd rate field, spend peanuts on the production, and nothing on promotion so the stands are less than half full, it looks bad…it looks worse. Of course the economics don’t work for spending millions on a fledgling league, it’s tough, until you get billionaires willing to throw a bunch of money at a women’s league – and do it over a long period of time, you can’t even get to the MLS level. The market where I live (Portland) will have the MLS Timbers, playing what I predict will be a rather unattractive brand of Football, we also have the (relatively) well supported UofP teams, where the Women (deservedly) get more press, bigger crowds, etc. than the Men. Personally, I’d rather watch the UofP Women or some ethnic match in the park than the product the Timbers put on the field, but that’s the “event” and that’s what’s on TV. The best product in my town is either UofP Women, or the local leagues, but Timbers are the story, if only because of millions of dollars. Well done Jenn, and well said cheekybackheel - we are dealing with deeply and profoundly reactionary forces here after all - FIFA, The English FA, The British Media, Sky Football Department (Smash it ? Seriously ? ), News Corporation etc etc. The Corporation that owns Sky also owns The Sun - the newspaper that supports women in sport through the world cup page three alerts. Fear, envy, greed, hate... these human passions have existed since the dawn of mankind. There will always be simple bitter and angry thugs who demean anyone who disrupts their version of a world where they are god. Every hero and heroine who stands up to people like them changes the world, and it happens every second of every day somewhere on the planet. Rio Ferdinand used his second well with his comments after the game calling the pair 'prehistoric'. I feel very sorry for footballing women in the UK because they exist in a place equivalent to what blacks went through in the South in the middle of the 20th century. And again those are the same human passions as we see out of South Africa, they're simply toned down by a more effective justice system. The sad part is Massey was removed from her past two games she was scheduled to do, with the second having huge demand from television crews for access. I can understand wanting the focus to be on the game but some things are bigger than the game and deserve it. First Lizzie Lambert and now Sian Massey - the times they are a-changin'. Evolution is a beautiful thing. Cheekybackheel, there's no denying that my argument has its faults. Women are largely underrepresented in the game and when they are represented, they are underfunded and degraded. That isn't to say that I agree with that at all, I simply am trying to say that there are problems with the way that this issue is often presented. I say this as humbly as I can, but I never even played soccer until high school, I didn't make the team my freshman year, and while I was offered scholarships, I don't play soccer in college. I play on the club team at my school, which is nothing special, but we actually resent the women's soccer team because they get funding from the school and we do not. They get a stadium and professional groundskeepers, and we get dirt fields behind middle schools. Wherever you look there will always be inequality. You can't have everyone having what they want because of limited resources. I completely agree with your point about De Jong and the other horrible footballers that are getting paid absurd amounts of money to play a game, but I don't think that the amount of money available for women's teams is really the problem. Its a social issue, not an economic one. If you were to compare the Prem with MLS, there's vastly more money in the Prem. If you were to compare my team with the women's team at my university, the girls are getting scholarships while I pay to play. And yet, people still play. Women still play. Men still play. Its a game. I play it and I follow it because I love it. Any woman (and I'm sure there are many) that can outsmart me about the game or beat me mano a mano or rival my passion for the game, I salute them. Yes, I grant you that footballers in England are given spectacular sums of money to compete and are given the facilities to train and perfect their art while women everywhere are subjected to working out on their own time and even holding a day job to pay the bills, but as a full time student, I empathize with those women. I know how it is. I don't care if you respect me or resent me for it. I care only about the game. I think if there is something good to come out of this who debacle, it's that there seems to be a huge outcry. Very few people are upset about the end of Grey and Keys. They're gone, and really everyone seems the happier. According to Phil Ball, in Spain there is downright outrage across the board. I just came across your blog for the first time and tremendously enjoyed reading this article. Thank you for putting so well in words what has been frustrating me for so long. It's really sad that 80% of comments I see out there on women's sports are derogatory. You really hit the nail on the head with part about women not getting the same training opportunities as men, and the lack of media coverage. It's interesting to think that even 40 years after Title IX was signed into law, so much is still left undone when it comes to equal opportunity.